Pes Planus is latin for flat feet or fallen arch, and refers to an abnormally flattened or spread out arch. The joints of the feet are weight bearing and can take a lot of abuse over the years. 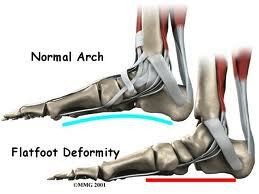 Faulty biomechanics from the feet can have a destructive effect on all weight bearing joints. This is where custom orthotic inserts play a role in preventing breakdown and treating flat feet. What is the most effective pes planus treatment? What exercises & stretches do you recommend for flat feet? What symptoms are most commonly associated with pes planus? What exactly is the foot arch & what shoes are best for pes planus? Where can I get medical hardware for my flat feet? Why are flat feet bad for me? Dr. Michael Horowitz offers a 5-Step process to successfully treat patients suffering from Flat Feet. He can help to evaluate, diagnose your condition, and recommend the best course of treatment. Feel free to click the folowing link to setup an appointment or call the office directly Vancouver Orthotics at 604-737-3668 for more information!